Ummm…. Yeah. I can’t say that I have a favorite social media platform. It’s more like a tolerate/hate relationship with the ones I’m on, because I can’t say I love them, really. So instead of waxing poetic on one, I’ll give my Pros for each. This is where I get to see what’s gong on with all my friends. Not necessarily my all my readers, because, allegedly, Facebook is more for my generation so I may be missing the younger gen of readers. But I do love the chance to catch up with authors and readers alike. I work from home (so little to no human interaction) and I have family and friends spread all over the planet. This is a fantastic way to check in on them easily. I see the most interesting posts on Twitter, maybe because it’s less about the memes than Facebook? Also, maybe because I see all the accounts I care about (unlike Facebook that limits what I’m seeing). I’m a particular fan of Nerdist. In addition, I find my author friends who are more about Twitter have funny posts, and that keeps me entertained (Sarah M. Anderson, I’m looking at you). Okay, now that I think about it this might be my favorite one, but not because I use it as a social thing. I use it as a research thing. I have boards for each series and pin all my research and images to those boards. Having those images is a huge help when I’m writing. I actually do like blogging. Most of the time. It takes a lot of time, but I love that it’s a chronicle of sorts, keeping track of my writing life as it goes along. I also enjoy sharing knowledge with other writers. Technically I’m on Instagram, but I can’t say I’ve gotten into the flow of using it. I should. I enjoy the images. I’m sure there are other forms of social media people will insist I should be using. But who has the time? I’m also trying to write a ton of books. I’ll wait until one of those gets to Facebook/Twitter level and then try it. I guess. I’m getting older, which means I’m less inclined to jump into change, so we’ll see. Lol. What are your favorite social media outlets, and why? 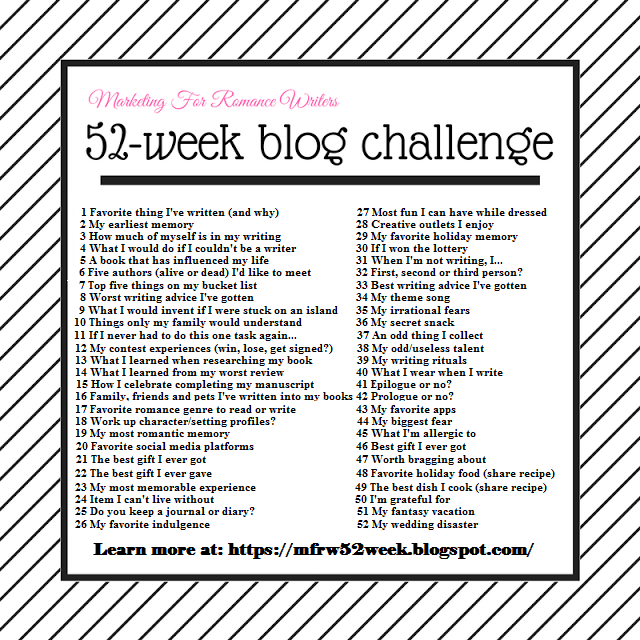 I am participating in MFRW’s 52-week blog challenge, and it’s a blog hop! If you want to see how other authors approach this topic, stroll on over to the other authors participating and find out how they deal with character profiles. Each author does it differently. ← Ummm… Isn’t It Supposed to Be “Happy” Mother’s Day?